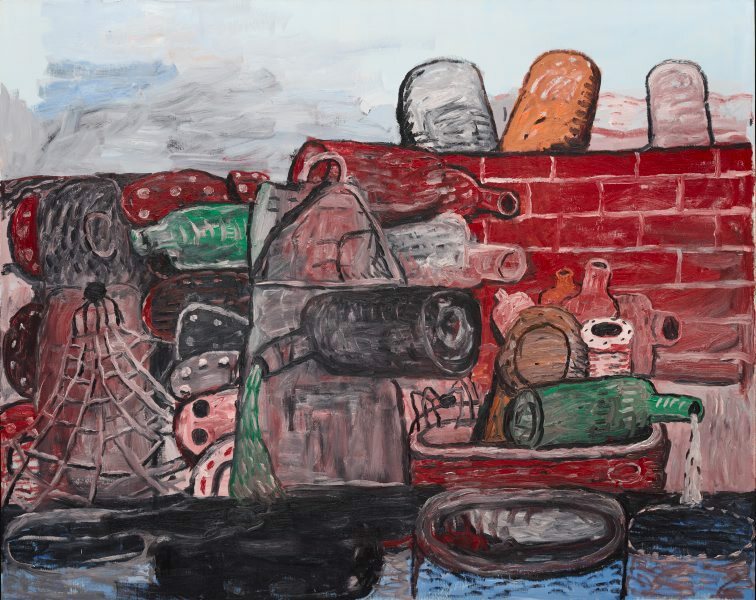 Philip Guston was a schoolboy friend of Jackson Pollock and, like Pollock, spent time in Mexico studying the murals of Diego Rivera and José Clemente Orozco which were to influence his later work. When Pollock moved to New York as an abstract expressionist in the 1930s, he persuaded Guston to follow. 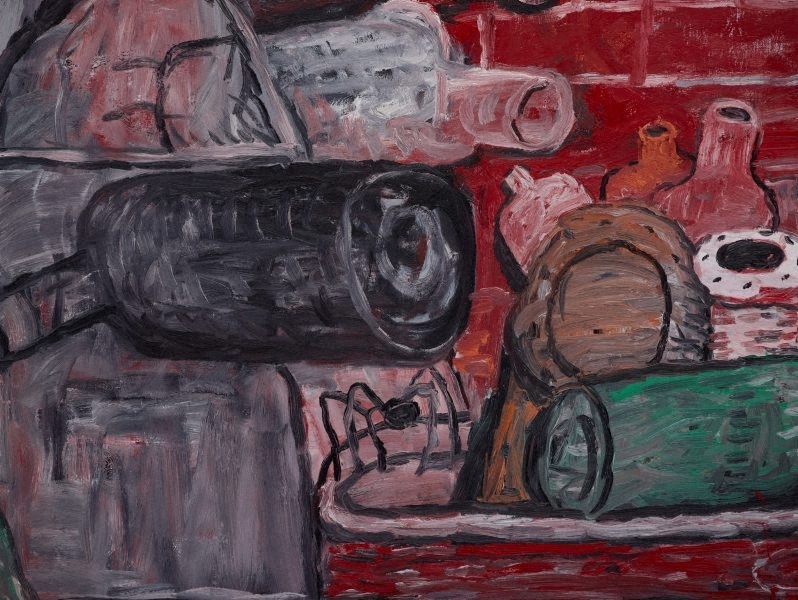 Guston moved through realist expressionism in the 1930s and 1940s to abstraction with the New York school of the 1950s, work which historian Leo Steinberg saw as ‘exposures of nerve-threaded flesh … scarred and stained with sin and hunger, pain and nicotine’.1 This period saw a dramatic change in his method and content, and great success found him lauded for his luminous and sensuous abstractions. 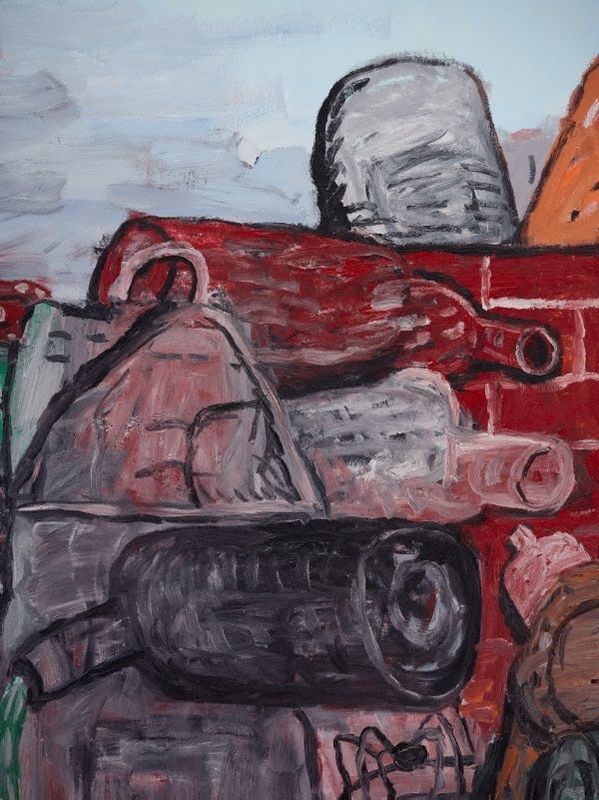 In the upheavals that followed World War II, Guston found his frustration with the brutality of the world was out of sync with his cool and restrained abstractions. He subsequently moved into a new figuration in which he could deal with his view of the world, with living and dying. His move away from abstraction split the New York art world with many commenting on his apparent defection and he was, for a time, excommunicated from the art scene. Curator Robert Storr considers Guston’s work represents a chronicle of the ideas and events that transformed American painting at this time. 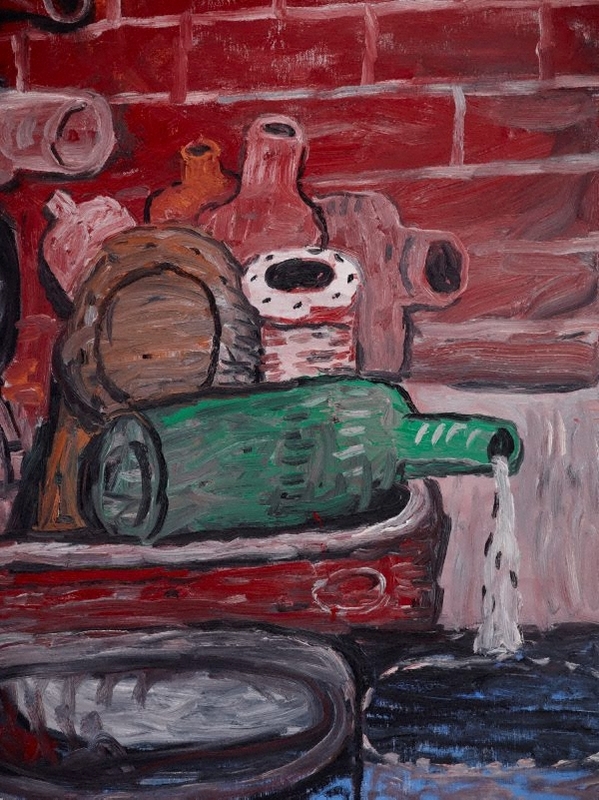 Guston’s interest in the metaphysical nature of painting appears as more than pure surface tension or paint application but as a ‘resistance’. This struggle with the picture plane is evident in his method of working on one painting at a time, putting the paint on and scraping it off in his attempt to conceive the work. On completion he feels ‘marvellous’ and yet doubts his ability to paint another picture, saying that ‘it’s somehow a feeling of all your forces, all your feelings, somehow come together and it’s got to be unloaded right there’.2 A night painter, Guston would often return to the studio in the light of day and be overwhelmed by the monstrosity of his imagination and the ensuing imagery. ‘East Tenth’ from 1977 represents the New York bohemian life of the East side with its industrial landscape and refuse. 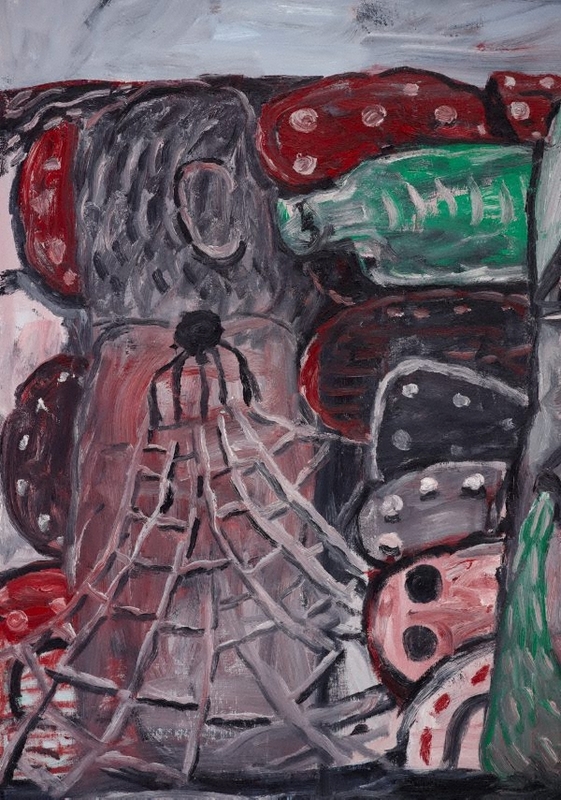 Referencing an earlier period that portrayed the Jewish Guston’s obsession with the Ku Klux Klan in Los Angeles where he grew up, the New York works show his renewed interest in the darker side of life. The honest brutality and crudeness of the paintwork reveals Guston’s desire to tell a story using pictorial devices that hint at a social decrepitude and his own allusion to the Jewish legend of the Golem, a metaphor central to Guston’s work of this period. 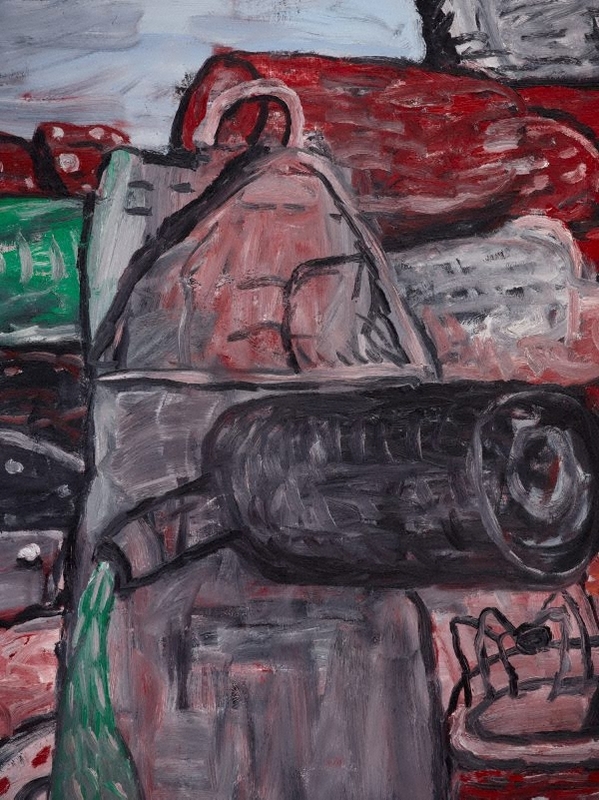 Many of his figurative pictorial motifs are evident in ‘East Tenth’: bottles, shoes, cobwebs, filth, a drunk peeing against the wall and an overriding feeling of gritty New York alleyways with their seedy underworld malaise. Signed and dated u.l. verso canvas, black fibre-tipped pen "PHILIP GUSTON/ ...1977/ ...". Donna Brett, Contemporary: Art Gallery of New South Wales Contemporary Collection , 'Expression and the figure', pg.108-153, Sydney, 2006, 130, 131 (colour illus.). Art Gallery of New South Wales Foundation Annual Report 1997 , Sydney, 1997, 14 (colour illus.). Bruce James, Art Gallery of New South Wales handbook , 'Western Collection: Paintings and Sculpture', pg. 17-77, Sydney, 1999, 71 (colour illus.). Aida Tomescu, Look , 'The art that made me', pg.14-15, Sydney, May 2015, 15 (colour illus. ).